I have been on a bit of a tear on this blog as of late on the topic of authenticity and ethics in social media. While this is a vital issue, I had intended to move on--and then I saw a Facebook advertisement that induced me to click. The experience I had with the Bank of America ad has returned me, once again, to the topics of ethics, authenticity and the danger of chasing "fans" rather than furnishing positive brand experiences. The Facebook ad that caught my attention asked, "How can you support service members and veterans?" The answer: "LIKE Bank of America to find out." So, I liked the brand. Want to know what happened? Nothing. Of course, I know how Facebook advertising works, so I did not really expect anything to immediately occur, although I wonder if less experienced Facebook users might expect an instantaneous response that furnishes the promised information. I proceeded to the Bank of America Facebook page to see if I could "find out" how to "support service members and veterans" as promised by the ad. To give credit where credit is due, the page has terrific content. It is obvious Bank of America is trying hard to produce content that educates and informs rather than merely amuses and entertains. In the past week, the page has furnished information on how to save money, teens active in the community and tips for new graduates. You can also find some military-themed posts, including a shout out for Armed Forces day and a link to a community that is a great resource for veterans. What I did not find--and what the Bank of America ad promised--was any information on how I can support service members and veterans. Perhaps even more troubling is that fact it took Bank of America less than two hours before they turned my "like" into an advertisement to my friends. I received reports from my Facebook network that a sponsored story was appearing conveying that I "like" the brand. So, to recap: Bank of America promised to tell me how to support service members and veterans if I liked the brand; they did not live up to that promise; instead, they immediately converted my "like," which was intended as a statement of affinity for service members and not for Bank of America, into an advertisement for the bank. Sadly, this sort of situation is hardly newsworthy. I am sure you have seen ads like this yourself. 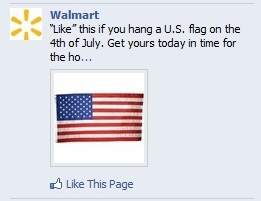 "Like" an ad because you support the US flag, and you end up being a friend of Walmart. Someone clicks "like" and is upset that a brand exploited his or her desire to help military members or support the US flag. Someone clicks "like" but does not notice they have actually "liked" the brand. Soon, brand posts are appearing in his or her or news feed, but the user does not know why. The brand posts will not be welcome, which means the consumer is likely to report it as spam, immediately unfollow the brand, or complain about the perceived spam in a post to the brand wall. About the best the brand can hope for is that the consumer will merely ignore the posts, which means before long the brand will have disappeared from that person's news feed; Facebook EdgeRank will have correctly intuited the person has no affinity for the brand and will omit future brand posts from the page. In both cases, the net outcome is that the brand will have paid for advertising that at best leaves the brand no better off and at worst harms the brand perception with consumers. What is highly unlikely to happen is that someone is induced to like the brand based on false pretense, sees the brand's content, welcomes it, engages with it and creates a relationship that keeps the brand in the user's news feed and moves the consumer through the brand journey toward acquisition or loyalty. There is a better way. A more ethical way. A more successful way. Instead of deceiving people into thinking they are liking one thing (such as support for service members) when they are really liking another (a bank), brands could simply opt to be honest. There are two ways of being honest--the hard way and the easy way. The hard way--the more successful way--is to create real fans by offering a great product or service experience, and then inviting those people to like your brand on Facebook. Those real fans will be more likely to welcome and engage with your content, to advocate on behalf of your brand and to become a strong, brand-loyal customer. You know many brands like this, ranging from Disney to USAA to Apple to Whole Foods. The easy way is to create an ad like Bank of America's ad and then deliver on the promise. Had the brand lived up to its promise of telling me how I can support service members and veterans, there would have been no adverse brand impression (and no negative blog post about the brand.) Bank of America could have opted to dedicate their company page entirely to content that lived up to the promise of the ad, at least for a short period. Conversely, the brand also could have launched its own military-themed page--"Bank of America supports service members"--and committed to engaging over time on nothing but this topic. Either way, the brand would have delivered on the promise in the ad and furnished a positive brand-building experience. The recipe for success with Facebook advertising isn't that tough, at least at a high level: Target the right people; test creative; and be honest in your advertising promises. The latter requires some work to make sure your paid media aligns with the information the brand posts on Facebook. Creating this synergy between paid and earned media is a strategy that works--and one that Bank of America failed to exploit. "Content is king." This is something I hear every week in conversations, at conferences and on blogs, but does the fact it is so often repeated make it true? Content is vital, no question about it, so perhaps it does not matter whether we coronate it as king, queen, prince or duke, but I question if giving the throne to content might not cause marketers to lose focus of more important needs and strategies in the social era. There are two reasons why I believe content is not king but something less. At a conference last week, I heard someone declare that "Content creates relationships." Is this really true? Do you love your spouse because he or she produces great content? Your friends may be funny, insightful or informative, but are they your friends because of what they say or because of who they are? Brand relationships are no different. Think of the brands you hold most dear--are you brand loyal because they produce great content? Of course, you may love Disney or FOX News, but in those cases content IS their business, but what about other brands you cannot live without? Do you love Google, Amazon, Zappos, Apple, Walgreens, Lowe's, Subway, Ford and Target because these brands produce engaging content? Content is not king. It is important, but it is not king. The king is customer experience. Give customers what they want when they want it, support them in new and innovative ways, make their lives better, and do this all at a reasonable value, and your brand wins. If you get the customer experience right, consumers will spread the word for you. Think of how you first learned about Amazon, Google, the iPhone, Instagram, Square, Facebook, Twitter and Zappos--was it from brand content or was it from friends and family? If you look at the brands that top YouGov's BrandIndex list, you will find some that produce good content, but many are not known for their content. What they all share is an obsession with furnishing the customer something different. Sure, you can read Subway's site to get tips on eating better, but what came first for Subway was not content but good, healthier, convenient, fresh fast food. Amazon produces almost no content, but it holds a special place in people's hearts and wallets by providing the most efficient and innovative retail experience around. Lowe's may offer some helpful DIY content, but is beloved for its competent employees, great online experience that enables shoppers to get info about past purchases and schedule reminders, and innovative Iris smart home kits. The lesson from strong and popular brands is that content is not king. Content cannot save your brand if it offers lousy customer service, a disappointing product and a terrible digital experience. In the social era, great content cannot overcome poor experience--your blog posts, infographics, tweets and Pinterest pins cannot win over customers who see poor ratings, hear friends gripe and observe brands focusing more effort on getting the word out than in changing the actual brand experience. One of the things that I think brands lose sight of in the rush to become social media publishers is that the laws of supply and demand apply as much to consumers' attention as to consumers' wallets. Fifteen years ago, brands spoke infrequently through infrequent channels--marketers may have produced a campaign every quarter, sent a direct marketing piece once a month and tried to get their information into traditional media via PR, but brand content was limited and sporadic at best. Today, brands' content machines rival newspapers'--every brand is attempting to be interesting, educational, funny and endearing through a constant, daily stream of content across dozens of channels. Consumers punish brands when content is perceived as advertising: Late last year, MediaBrix released the results of a study that found that advertising appearing as content (so called "native advertising") negatively impacted or had no impact on brand perception. For example, 85% of people who had seen sponsored video ads that appear to be content said the content negatively impacted or had no impact on their perception of the brand being advertised. The 2012 Digital Advertising Attitudes Report found that 20% of US consumers would stop using a company’s products or services entirely as a result of receiving too many advertising messages, while 28% would be less likely to respond positively to that company in the future. Consumers suffering information overload turn attention away from brands: Do you sign in to Facebook to see what brands are saying or what friends and family have to say? It's no different for your customers, and the result is that brand engagement is meager. According to the Ehrenberg-Bass Institute, just 1.4% of the fans and friends of fans of the top 200 brand pages on Facebook are actually engaging with those pages. A recent Forrester study found that over the previous three months, less than half of people on social networks have interacted with a brand through social media; moreover, just 7% say they've followed a brand on Twitter and 7% say they've posted feedback on a company's social networking profile. Content is vital. I am not suggesting content is not a worthy marketing investment, but when I read that marketers are investing more in content creation and management than in search engine marketing, web site usability and design, mobile and the commerce experience, I question if the priorities are right and we are allocating budgets where they are most needed. Content strategies are easy to grasp and "in the wheelhouse" for marketers, but we must first ensure our organizations are prepared for the era when customer sentiment trumps advertising, press releases, blog posts and other forms of branded content. Brands have their own version of Maslow's Hierarchy of Needs, and content does not rest at the top of the pyramid. Getting your product and service right, having the right digital and mobile tools customers need and want, and being responsive to customer needs in all channels are more important than content. The best content in the world may help to gain a little attention, but it will not sustain a brand that does not get the fundamentals right.